Creating an outdoor room is like adding an extension to your home – minus the expense, noise and dust. Whether you’ve got a roomy deck, rustic little patio, or tiny high-rise balcony, this three-step plan to set up your patio furniture will maximize your home’s outdoor space. • Do you see yourself hosting dinner parties or BBQing up a storm? • Prefer lounging around with your family while sipping iced tea? • Are you more into a private nook to share with your love and sipping sangria? You can borrow from indoor spaces on how you want the outdoor furniture to function. Is it for entertaining? Or maybe it’s more about hanging around the campfire. This stage of setting up your patio is bout what kind of outdoor space would make your life happier, and take it from there. Now consider the zoning for your outdoor furniture. You may have room for multiple activities and functions – cooking and entertaining, perhaps – or just one top priority, like a cozy lounge for two. If you are more about entertaining, then set up your outdoor furniture set like this. Don’t lose sight of your space’s dimensions when window-shopping for patio furniture. Note the measurements of patio furniture you’re considering, and use painter’s tape to mark them out on your deck, patio or balcony floor. Live with these outlines for a few days to determine if the arrangement works for you. 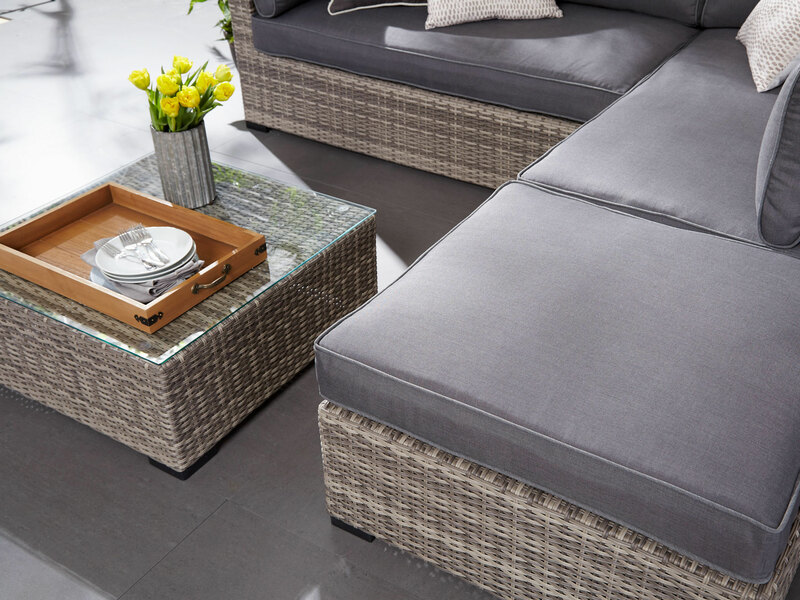 TIP: Save space with multipurpose patio furniture pieces like an outdoor ottoman that doubles as seating. Consider shape too. A circular patio table is easier to walk around than a cornered one. And with a round outdoor table, you can squeeze in an extra seat or two, too! Before you buy an outdoor sectional – read this! Step 3: Set up your patio furniture and style it! Set up your backyard living space so that it reflects back to your thoughts in Step 1. Have the patio furniture pieces so that they face each other, surround a fire pit, it’s time for the finishing touches with some smart outdoor styling. • Add a lantern or two. Group lanterns and votives throughout the space. • Toss accent cushions on seats, sofas and sectionals. • Drape a throw over a sofa or sectional arm. • Bring life to your outdoor room fresh-cut flowers or a potted plant.